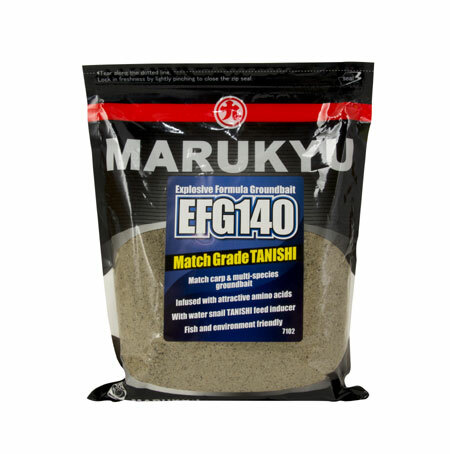 Pasture Marukyu : MARUKYU Groundbait EFG 140 - Groundbait - Match Grade Tanish feeder gara - Conf. da 700 gr. Sei qui: Home Esche e Pasture Pasture Marukyu MARUKYU Groundbait EFG 140 - Groundbait - Match Grade Tanish feeder gara - Conf. da 700 gr. MARUKYU Groundbait EFG 131 - Groundbait - Nori all species/temperature 700gr Method feeder garaMARUKYU Groundbait EFG 142 - Groundbait - Match Tanishi Enhanced feeder gara - Conf. da 700 gr. Pastura EFG 140 della MARUKYU. Composta da ben 57 ingredienti è una delle piu’ complete nella gamma, con all’interno il TANISHI (lumache di mare). Usando un mix di 2 dosi di pastura ed 1 di acqua si ottiene una pastura molto compatta che si rompe molto lentamente, se invece si vuole rompere la pastura più velocemente il mix è 3:1 ottenendo una vera e propria esplosione. Con un mix 1:1 si otterrà una pasta molto soffice. Caratteristiche di grana fine di colore marrone scuro ideale per ciprinidi, breme, tinca, cavedani, scardole e carpe. ottima per innesco a pastorello per grossi pesci. EFG140 is a Marukyu groundbait bait that looks different to almost every bait available in the UK. Moreover, it works in a different way as well. It contains an incredible 57 main ingredients and is packed with animal and fish-based proteins, including Tanishi and Sanagi. Marukyu EFG140 groundbait is perfect for Stick Mixes and PVA Bag mixes. It is the ultimate Specimen Carp Groundbait. A fine particle groundbait full of ocean and marine proteins and amino acids. perfect for feeder and method fishing. Marukyu Field testers have had incredible catch results with EFG 140, it is amazing at low water temperatures. This is amazing bait with multiple uses. But there is so much more to this versatile bait. EFG 140 is an all temperature, multi species bait that will not blow. There is no need to use a massive amount as the attractants mix with the silt and mud and keep fish actively looking for food for hours. Marukyu products have many unique ingredients. The clever part is how these have been blended together to make exceptional baits that catch fish consistently. Take two additives that have been scientifically proven to be highly attractive to coarse fish, carefully formulate them into baits and groundbaits, and then bring them half way around the world to the UK. That's the huge edge that Tanishi (water snail) and Sanagi (Silkworm chrysalis) will bring to anglers who use them. On lightly-stocked venues, the feeding triggers they release will draw fish away from natural food; on pressurised venues, these triggers will over-ride the caution with which fish approach potential food; and because the smell and taste of both natural ingredients is complex, they will not 'blow' and become ineffective in the way that unsophisticated baits laced with artificial flavours may do. The following information is taken from some studies on the Marukyu groundbait that DAvid Ewing has done with the Marukyu Pro team in the UK. Marukyu EFG140 groundbait is one of the specifically designed Carp groundbaits. Marukyu EFG140 groundbait has a fine grain and has the overall feed content than of the 140 range. The EFG 140 groundbait is perfect for a stick mix when carping. If you are going for Specimen fish then Marukyu EFG140 is the ideal groundbait. EFG140 groundbait has a greyish appearance and comprises a mix of over 50 active attractants. A big feature of Marukyu EFG140 is the tanishi element. Tanishi is Japanese for the freshwater snails like nerites used in Asian cooking and harvested for the table like our land snails. What Marukyu do with snails in the processing is interesting. In EFG140 groundbait are white particles which are dehydrated snail bodies and grey/black particles which are shell and other particles which are shell and body dried together. As well as tanishi the other fishmeal and marine proteins all breakdown at different speeds, this means there are different attractants released at different intervals, giving you more opportunity to switch the fish on to feeding. What does Marukyu EFG140 groundbait look like? The overall colour of EFG140 groundbait is grey and there are chunks of pellets in the mix, the odd pink fleck and loads of white and grey particles – some sea snail particles – of different sizes. Mixing ratio of Marukyu EFG140 groundbait; Mix EFG140 groundbait with 4 parts powder to 1 part water. No need to riddle,, just mix in a small bowl and rest for a moment or two. This might seem very dry but the ingredients do come together. To make a stickier method mix add a little more water. The low water content is no doubt to help with PVA products. What does Marukyu EFG140 groundbait behave like? Once EFG 140 groundbait is mixed and in the water it actually opens up very fast. Some of the whiter particles get a grey fuzz on them which is the start of this very slow breakdown speed. Others start fizzing and pinging off little micro bubbles. There was no core to this bait after 2 minutes, in fact after a minute in the water it was fully opened. In fact the bait once opened looked remarkably like the silt and gravel you find on the bed of say a gravel pit. Breakdown speeds – mechanical breakdown and leakage breakdown. This is an aspect of Marukyu groundbaits that comes straight from laboratory testing. Breakdown speeds. Now when we think of a groundbait and breakdown speed we think of mechanical breakdown – how long it physically takes the groundbait ball to open out and how long it stays in place before being washed away. Marukyu groundbaits have this element too, of course. The use of yeasts, glutens and carbohydrates like yam, rice and wheat’s all work on mechanical action exactly like our classic British groundbaits. But the Marukyu researchers look at leakage breakdown too. By this I mean how long each particle will be leaking out amino acids and attractants. Some particles work quickly, pumping out and attraction almost immediately on contact with the water but getting washed up after a minute or two. Others work on slow release and sit and breakdown over varying periods of time. The fishingbaits.biz team has invested a lot of time with Marukyu, in return Marukyu's knowledge, expertise and energy has ensured the information included on the fishingbaits.biz site is up to date and gives us anglers the right information to help catch more fish. Roy Marlow, Bruno Broughton, Tim Hodges, Jamie Masson and Andy Kinder have all contributed by imparting information on how the baits are put to good effect.